So far Chiang Mai is the perfect place for us to settle into while the rest of our plan ages, ferments, and generally gets its a$$ in gear. The city is large enough to have all the conveniences of city living (great apartments, a plethora of coffee shops, plenty of restaurants of every possible type, numerous sites to see, and a diversity of people to make for good people watching) but small enough that we can get out pretty quickly to enjoy some peace and quiet. 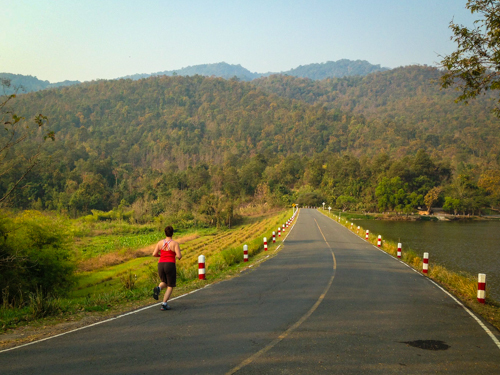 We discovered Huay Tueng Tao lake in an effort to stay get in shape (well, in a shape other than round anyway). Unless dodging traffic on narrow roads while sucking back exhaust fumes is going to become the next Olympic sport (which it totally could now that they have ousted wrestling) there isn’t much point to trying to run in the city proper. Located about 10KM outside of the city (on Canal Road, or Hwy 121 for those interested) the lake sits in the shadow of the mountains and is the perfect place for a quick morning run. It’s about 4KM around. It really feels like running at home, as if passing by golden Buddhas, farmer fields, and jungle swamps while jogging is anything like home. It’s cool, quiet, and relaxing (in the morning, that is. In the afternoon, and on weekends, it is overrun with city folk kicking back and escaping the city heat). There is also a 7KM hike that starts on the back side of the lake. We went on Monday to check it out. We started right behind the Buddha that looks out from the back side of the lake. 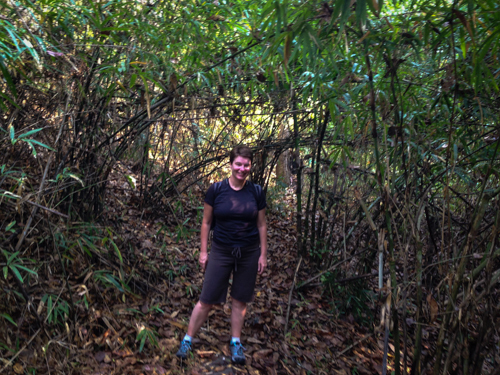 We literally just walked into the jungle and followed an irrigation canal until we caught sight of the trail. Probably not the recommended way of starting a hike but then neither is not telling anyone where you are going or not bringing any food. Hindsight, right? 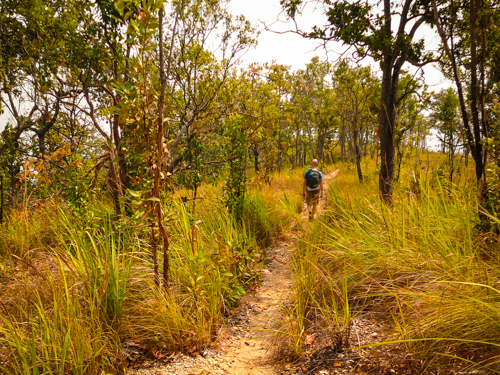 The trail is pretty easy to follow; even easier if you bring along the map from this Beautiful-ChiangMai.com post that details the hike along with GPS files. It’s a circular hike which I enjoy much more than there-and-back hikes. What was really interesting about the hike was the foliage change throughout. On the way up (and I do mean up, there were some steep sections!) it was evergreen forest/jungle with ferns, bamboo, and plenty of plants that I can’t identify. Yes, I already colour corrected the photo. I am that red/pink when I exercise. I get the weirdest looks (and the occasional sniggering at) and have often been asked if I’m okay but it’s perfectly normal for me to turn as red as a beet root at the mere thought of moving. I also sweat. A lot. Yep, it’s a pleasant day in the park working out with me. Disappointingly there wasn’t much of a view at the top. The summit (well, just below it actually) is marked with a crude helicopter pad that afforded a good place to rest but the hazy day didn’t allow much of a view. Bummer. The path down was on the other side of the hill and the vegetation there was much different than on the way up. It was much drier, grassier, and only partially shaded by small teak trees whose large leaves were strewn all over the path making the steeper sections of down quite slippery. The best part of the hike was at the end. Isn’t that always the case? 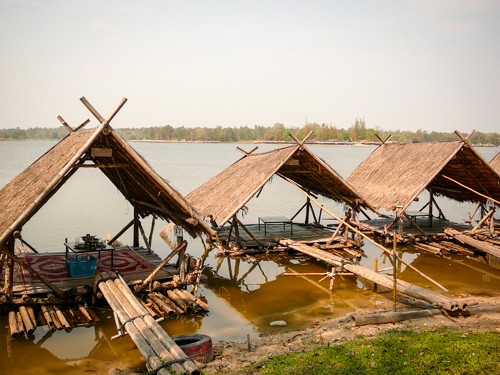 The lake is rimmed with these cute little floating huts. For 10 baht you can lounge in the cool shade to your hearts content. It gets better. Each clutch of hutches is associated with a restaurant of sorts. Someone will bring you food and beer!! Wandering vendors visit periodically with treats like fruit, nuts, and bugs. Yes to the sugared tamarind. No to the packaged spiders. And so we worked off the hike by lounging and lolling, eating and drinking, chatting and laughing. If only all hikes could end this way! 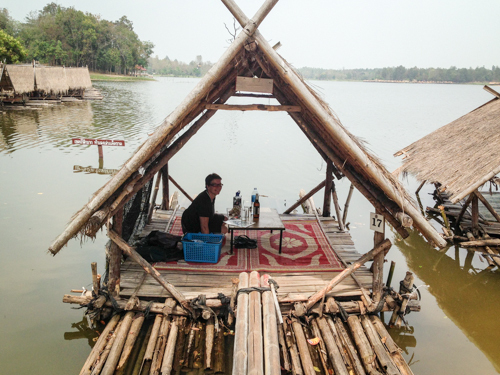 [box border=”full”]Looking to get connected to your trip to Thailand? Here are some great books to try. The Beach The classic backpacker novel set on one of the most beautiful beaches in the world. Once you’ve been here you can understand why they wanted to ‘protect’ it. Phra Farang A look into Thai Buddhism, and becoming a monk, from a Western perspective. Sightseeing Set in contemporary Thailand, these are generous, radiant tales of family bonds, youthful romance, generational conflicts and cultural shiftings beneath the glossy surface of a warm, Edenic setting. Oh wow! Considering the heat I’m impressed with the commitment to running. I’ve found it hard to even slouch/walk in the heat some times, so this would have been a little tricky. Worthwhile at the end though, what a great place to find! That looks nice. Are there gym’s in Chiang Mai? 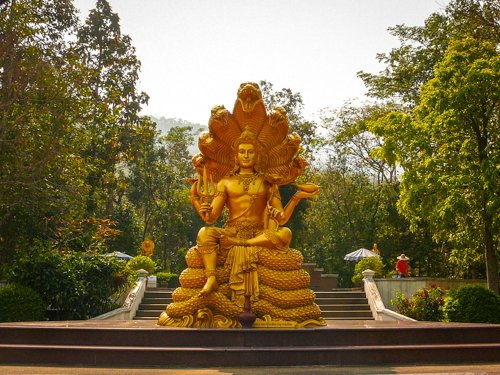 I need to stop reading about Chiang Mai because the more I read the more I want to go there, but if I go there I’m afraid I won’t want to leave. Props for running in the humidity. I tried it in the Philippines, and it’s so much more taxing. On the island here I might be able to run in the late afternoon when it’s less humid, but I don’t know. I can handle running in dry heat, but humidity kicks my hiney. Those huts look awesome! Great way to end a hike! Tony & I remark every single day that if only the temperatures here in Asia were like they are at about 7 pm every evening but ALL DAY we would get so much more done! The middle of the day is just so brutal… kudos to you for working out routinely over here; I am constantly having to remind myself that when I sweat so much it looks like I have been swimming, it is healthy and good for me and my body’s way of keeping me cool, not making me miserable… that works about 50% of the time! 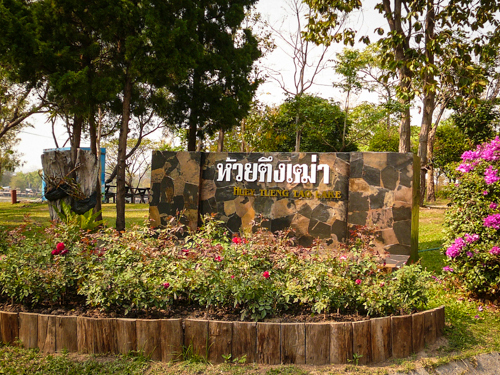 Anyway, I’ll have to bookmark this hike and running trail since we plan to go to Thailand and specifically Chiang Mai. Looks perfect for getting some rest. Mmmm…packaged spiders! Sounds like a great adventure and love the relaxing huts at the end. This is one way cool hike and with your love of beer what a great end to it as well. I bet you have to get hiking first thing in the morning or you would be even redder. I can relate – I too get pretty darn red – but I always love the glow after the fact. Sounds amazing! Love the end… and yes, I am that red too. I sympathize with the weird looks. We were at the lake yesterday! great place to escape the city for a while. Haven’t tried the hike from behind the Buddha yet – maybe next time!